It's a refrain Daniel Solms hears often. "I saw your area and signage at Parkview Field." That's what many students share with Solms, Huntington University's Vice President for Enrollment Management and Marketing, when they're asked how they came to consider attending the Christian liberal arts college that's located about 25 miles southwest of downtown Fort Wayne in Huntington, Ind. With tiered, picnic-table style seating for 800, it's impossible to miss the Huntington University Picnic Pavilion down the right-field line at the home of the Fort Wayne TinCaps. It's the largest of the ballpark's special areas for groups. "Our sponsorship with the TinCaps is a great opportunity for us," Solms says. "It allows us to be part of Fort Wayne's cultural fabric, since Parkview Field is the hub of the Fort Wayne community in the spring and summer." Considering how the TinCaps have hosted more than 5 million guests in Parkview Field's first 10 years - 4 million-plus for games and another 1 million-plus for non-baseball special events - plenty of eyeballs have had the chance to see HU's branding. "In this digital age when it can take 15-20 touches for people to become aware of your product, our marketing at Parkview Field is an excellent way for us to create awareness in a family-friendly environment," Solms says. Huntington University first teamed up with the Fort Wayne franchise back in 2001, when the team was known as the Wizards and played at Memorial Stadium. The partnership grew after the Wizards became the TinCaps and moved into Parkview Field. In 2010, a year after the award-winning venue opened, the school sponsored the ballpark's foul poles. Those signs earned some extra exposure that year when the TinCaps hosted the Midwest League All-Star Game (which included future big league stars like Mike Trout). During the Home Run Derby, TinCaps first baseman Nate Freiman (who'd go on to reach the majors himself) smashed a home run down the left-field line that shattered part of the Huntington University sign. 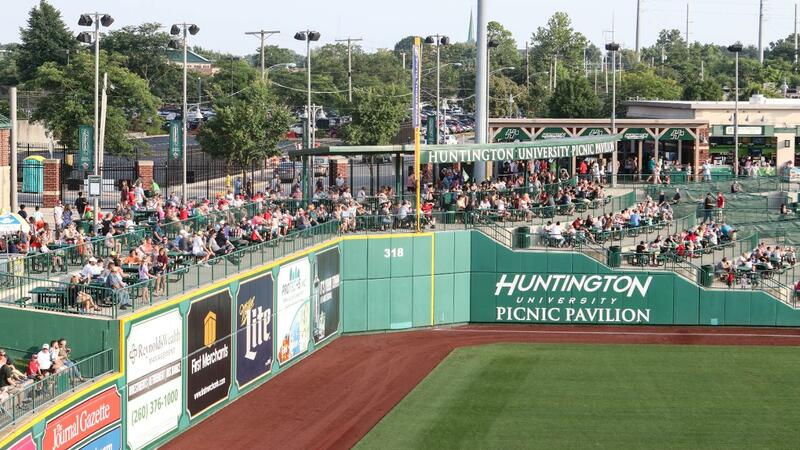 Fortunately, there was insurance to cover that… And fortunately for both sides, the partnership between the TinCaps and Huntington University has shown no such signs of fracturing. Instead, it further evolved in 2013 with the Picnic Pavilion sponsorship. "Huntington University has been a joy for us to work with," says David Lorenz, TinCaps Vice President for Corporate Partnerships. "You can't properly activate a deal without both sides coming together, and Daniel and his group are phenomenal at what they do. We're glad to have them as part of our team with the TinCaps." For Lorenz, a sponsorship goes well beyond signage and advertising. It's about having a relationship. Case in point-over the years, the TinCaps have donated baseball gear and equipment to the Huntington University Foresters baseball team. Beyond that, the TinCaps have passed along signs and picnic-table umbrellas with HU's branding back to the school. Additionally, TinCaps President Mike Nutter has visited campus to speak with students and faculty. Solms says Huntington University also is grateful for how the TinCaps help employ both current students and graduates at Parkview Field. In particular, Huntington's rising digital media arts department has become a feeder for the team's video production crew. Even Johnny TinCap and Norm the Forester are good friends. "The TinCaps and Parkview Field wouldn't be the successes they've been without the support of our partners like Huntington University," Nutter says. "It's an honor for us to work with an institution of Huntington University's reputation. I'm glad our brands have aligned for so many years and hope they continue to for many more to come." As part of the seating area sponsorship, Huntington University also benefits from having its name on every ticket sold in that area. This past year, Solms himself found it satisfying to be invited to three separate functions hosted by other organizations at the Huntington University Picnic Pavilion. "Those events represented three different sections of my life outside of the office," Solms says. "It goes to show how many people engage with the TinCaps and Parkview Field. There's certainly a sense of fulfillment in seeing other organizations hosting their group outings in a space with our name on it and helping to get our name out there even more." Other marketing elements include exposure in team advertising materials, ballpark announcements, and media coverage. Meanwhile, several times a season HU also takes advantage of the perk of having VIP usage of the area to host their own students, staff, and other guests. After all, it's tough to top a night at the ballpark with special views and company… not to mention the all-you-can-eat picnic. "Our partnership with the TinCaps has really been such a positive overall experience for us," Solms says. "With our sponsorship at Parkview Field, it really makes us feel like part of the community in Fort Wayne."